The rumors of the iPad 3 having a Retina display appear to have gotten a significant boost with a report from Macrumors this evening. The site got ahold of a panel that they say is a the same one that will be used in the iPad 3 and shoved it under a microscope. Apparently, their findings confirm the fact that Apple’s next tablet will pack in a 2048×1536 Retina ready display. The shots under the microscope show that the pattern of pixels is roughly 4x the density of the iPad 2’s display. This means that the math does work out to a double-resolution Retina panel when compared to the iPad 2’s 1024×768. Macrumors is convinced that this is the display that will appear in the iPad 3, but there is no absolutely sure way to tell at this point, so we’re withholding our judgement. 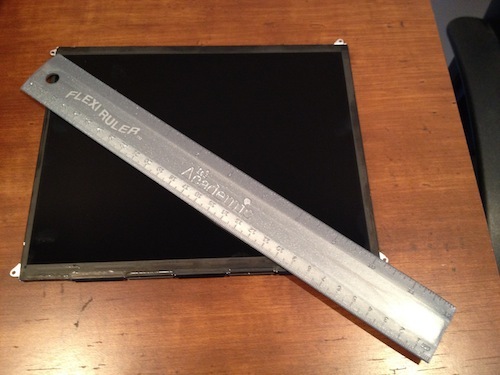 That being said, from the measurements and look of the display, this appears as legitimate a bit of proof that the iPad 3 will have a Retina screen as we’re likely to see pre-release. The rumor mill has been kicking into overdrive about a Retina display coming in the iPad 3 among reports that Apple was asking developers to upgrade their app previews to Retina-ready resolutions. We had also previously received reports that Retina resolution graphics found in the iPad 2’s recent software updates were no accident, and that they were meant to prepare for the iPad 3. Apple is currently finalizing plans for the launch of its new tablet, which should make its debut on March 7. The iPad 3 is rumored to contain an A6 processor, either dual or quad-core, a Retina display and a 4G LTE capable radio in applicable models.